Turning an office system on its head. Rockwell Unscripted is hospitality, theater and play at work. It sets the stage for life to take place. An unconventional office furniture collection of improvisational elements that demanded an equally unconventional and improvisational approach to the branding. The collection responds to the user’s working style, turning the typical office system paradigm on its head. It’s uncorporate, unrigid, and untraditional. We decided to unshow the collection by inverting the usual approach of showing off the product. Instead, we put the user experience and environment at the forefront, shifting the focus from the design nuances of the objects themselves to the experience – one that is simultaneously highlighted and hidden. Design details reference the signature hand holes in the tables and seating, while spot varnish highlights the furniture silhouettes. Translating the Unscripted experience into a visual concept, we utilized wraparound text and inverted typography that invites users to rotate the brochure, themselves, or both. The branded language extends to the digital experience, where we get a more immersive look at the collection. Inverted typography, plan views and an endless scroll through Unscripted scenes give texture and context to the experience. 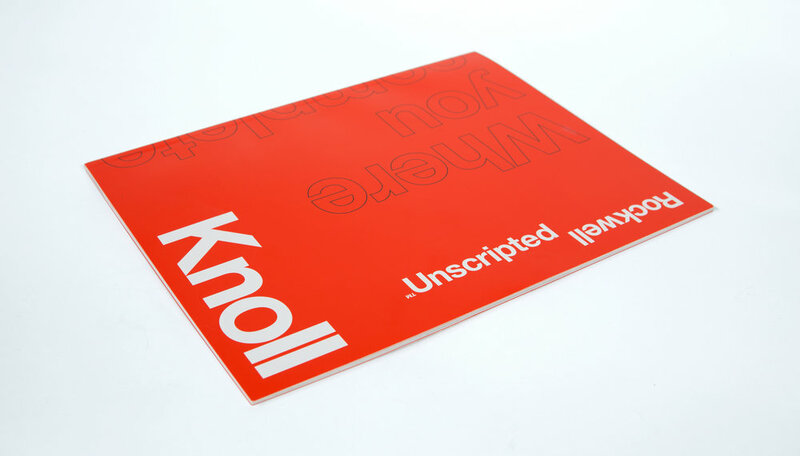 Completed by the in-house design team at Knoll in concert with Schema Design, the site gives users a sense of the variety and vibrancy that the Unscripted collection offers. While staying true to the Knoll typographic purity, a simple visual gesture quickly evokes the spirit of the brand and the people who engage with it. A lexicon of un- words simultaneously describe what the collection is and isn’t. A freeform narrative style expresses the improvisational nature of how the collection is designed to be used.